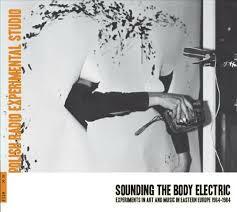 Continuing from previous week, in this episode we also talk about the ‘Sounding the Body Electric’ exhibition at Calvert22 gallery, London. This time we also get to hear more sounds and interview with Daniel Muzyczuk (in Polish). This entry was posted in Polish Deli, Shows and tagged Calvert 22, Daniel Muzyczuk, David Crowley, Eastern European Art, interview, london, Polish Deli, Polish music on July 9, 2013 by kaziem.